Having the right high-speed disc for your operation makes all the difference, which is why Flaman has two reliable and innovative options from K-Line Agriculture for you to choose from: the K-Line Ag Speedtiller and the K-Line Ag Powerflex. 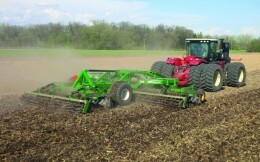 Their one pass seedbed prep and ability to easily break down heavy crop residue will save you time and increase the organic matter in your soil which will lead to higher yields. 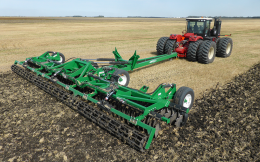 The Speedtiller features lateral disk gang adjustment, allowing you to adjust for removing ridges in the soil profile, chop root masses, increase weed kill and overall improved mulching capabilities. Additional features include heavier disc weight to cultivate at deeper depths (up to 6”) for one-pass operation and improve trash handling, and its innovative fold design which allows for easy transitions from work to transport mode. The Powerflex is equally as efficient in prepping your seed and breaking down trash residue, and is designed to handle all types of soil, from wet and sticky to sandy conditions. At Flaman, we have a team of knowledgeable staff ready to provide the information you need to make an informed decision on equipment for your farm. Visit your nearest of 9 Flaman dealerships across Western Canada to chat with one of our ag experts today to learn about our full selection of farm implements.